I held back on reviewing Pokki for a long time. That was probably not the best of ideas considering that it is one of those rare gems that you stumble upon from time to time. For now, Pokki is a free software for Windows 7 that adds information, services and features to the Windows taskbar. The developers have plans to add support for Vista and XP in a future version. Pokki is app based, which means that users install the main client and then the apps that they want to use. Apps include popular choices like Gmail, Facebook or eBay, but also apps that are more on the geeky side of things. This includes an awesome headlines app that is displaying RSS feed contents, a Google Search bar app to start a search on Google directly from the taskbar or a file uploader. 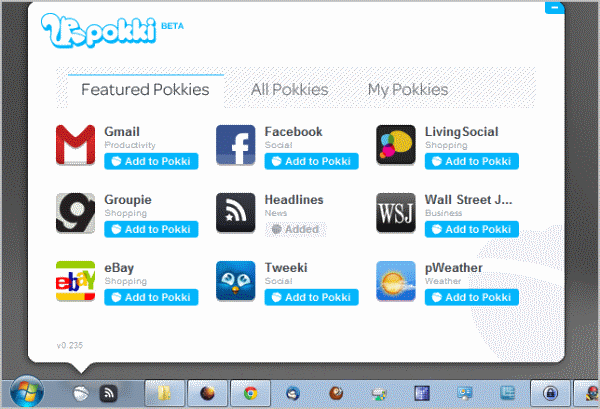 You install Pokki by selecting one of the featured applications from the Pokki website. This installs the application and the main client on the operating system. The icons are placed directly between the start menu button and the first icons of the taskbar. This takes some getting used to time as it moves all the icons to the right (I have several tabs pinned on the taskbar). Individual applications are then launched with a single click on their icon. The interface opens up fluently. The headlines app for instance displays a selection of default and custom RSS feeds in its interface. 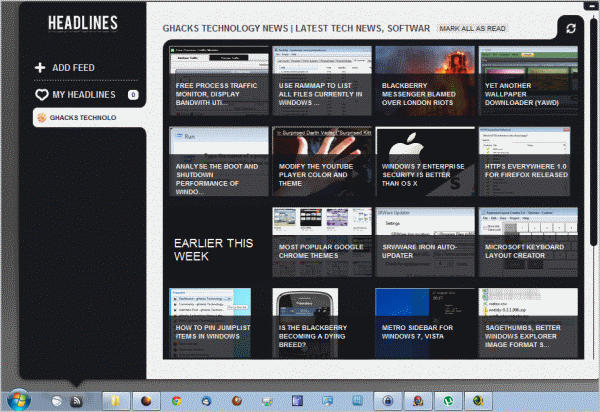 Options are provided to add custom RSS feed links to the application which are then displayed on the left side. Options are then available to display news from all RSS feeds in chronological order or news from one specific RSS feed. Pokki's concept is rather unique and interesting. The developers need to push out new applications to increase the reach of their application. That, and support for Vista and XP seem to be the two important things that need to be addressed. The apps could use tooltips that describe what they do as well. Don't get me wrong though. Pokki as it stands is a great program for the Windows operating system. At least a few of the available apps should be useful for the majority of Windows users.